They’re watching, whether the whole world is watching. 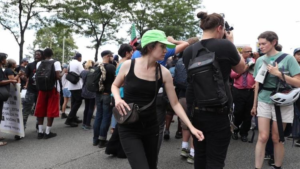 Legal observers in green hats are part of Chicago protests. The first lawyer to arrive stood, as usual, at the edge of the protest. He waited and watched the police as the police watched the protesters, who readied themselves to march, ignoring long silent rows of officers. He fingered his notebook, but generally he didn’t take notes — he didn’t want to look down and miss anything. The lawyer wore the same green baseball cap he wore to every protest, and since he had been watching the police watch protesters for many years, that hat was faded from sun. This was early August, at a corner in Lakeview, as organizers of an anti-violence march prepared to shut Lake Shore Drive. The attorney, Jerry Boyle, a longtime Chicago trial lawyer, had come straight from his office. Aside from the green hat, he wore a pinstriped suit and a necktie. If he needed to move through a police blockade, he reasoned, “they might move aside for a cornfed white boy in a suit, because that’s how power works in this culture.” But he wasn’t expecting trouble. Protesters and their children were drawing on the road in chalk, some officers were bending over to casually admire the artworks. “It’d be bad optics to mess with this,” Boyle said. Boyle is a Legal Observer with the Chicago chapter of the National Lawyers Guild, an 81-year-old organization of left-leaning lawyers who support progressive causes, founded as a counterweight to the famously conservative American Bar Association, which excluded African-Americans from membership until 1943. They wear green hats with “Legal Observer” stitched across the front — in fact, the guild, which keeps its national headquarters in New York, trademarked the phrase “Legal Observer.” If you attended a protest in the past 50 years, there is good chance a Legal Observer was watching. More than 50 watched NATO protests in Chicago in 2012; almost as many watched local marches in the days after Donald Trump’s inauguration. By August 1968, though, after years of civil rights and Vietnam War marches ending in police clashes and mass arrests, protesters were looking for regular, legal rule keepers to watch from the margins. The NLG’s observer program got its feet wet in Grant Park. Fifty years later, NLG Legal Observers — which the organization estimates are 60 percent of its 3,000 members nationally — still work at the sidelines. They take notes on intimidating behavior and perceived abuses of power, they scurry for the names of protesters being arrested, they serve as eyewitnesses should a civil or criminal trial arise out of an arrest at a protest. But primarily, Legal Observers reiterate, their goal is expectedly passive, to serve as a silent reminder to the police that a lawyer is watching. They chatted, caught up on life, the officer walked off, the march began. “You never do know what you’ll get,” Boyle said to himself. Legal Observers are usually lawyers, law students or legal assistants. They get the correct spelling of the name of a person being arrested (a bad spelling wastes time), they contact family members about arrests, they monitor immigration raids, they hand out know-your-rights cards, they even warn activists of suspected undercover police. In August 1968, though, the Chicago chapter of the Lawyers Guild was still rebounding from its relative obscurity during the McCarthy era, when the group was often regarded as a Communist front. For decades it had been investigated by J. Edgar Hoover’s FBI. By the time of the DNC, having Legal Observers monitor authorities “felt like a new idea and a very old idea,” Dohrn said. Martin Luther King Jr. and Robert Kennedy had been assassinated, sit-ins occupied colleges and protesters were descending on Chicago. Months of rioting and demonstrations appeared to be coming to a head. According to David Farber, a University of Kansasprofessor and author of the history “Chicago ’68,” antiwar protest organizers decided as early as January to have legal watchers on hand. 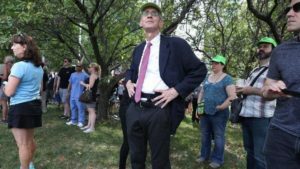 As Jerry Boyle scanned the crowd along Lake Shore Drive, more Legal Observers began arriving and tugging on their green hats and pulling out pens and notepads. Suddenly a protester walked up the off-ramp chanting “Shut it down! Shut it down!” A police officer moved close to the man and urged him to step off the road and onto the grass. “Don’t push me!” the man yelled at the officer. A moment later, as if he had been waiting in the wings, a man on a bike pedaled up, braked and shouted at the protester: “Don’t pretend like you didn’t come here to cause problems!” Police shifted. Boyle walked calmly to the protester and stood with his head down, as if studying grass. The protester shouted at the counterprotester, who shouted back but won few sympathizers, and soon the protester walked off. But Boyle remained standing by the counterprotester, his head still down. He pulled out a cigarette and smoked and waited as the man watched the march coalesce. Then, after several minutes, Boyle held his phone in front of the man’s face and took his picture. The man did the same with Boyle. Since the ’68 DNC riot, Lawyers Guild observers have watched nearly every major protest in the United States. They have watched tenant rights marches and Black Lives Matter protests. They have helped bring cases against the police at the Standing Rock pipeline protests, and testified against police after protests in Ferguson, Mo., over a white police officer’s 2014 fatal shooting of a black teenager named Michael Brown. More than 30 watched police in Charlottesville, Va., during a 2016 white nationalists rally (which led to the founding of a local NLG chapter there). In Chicago, they have attended every major protest about the fatal shooting of Chicago teenager Laquan McDonald by Chicago police. And if anti-violence protesters shut down the Kennedy Expressway on Labor Day, as planned, there is a good chance that observers will be there, too. In the 1970s they wore red hats; in the 1980s, during ACT UP protests regarding the White House’s handling of the AIDS crisis, they wore pink hats. This month, coming full circle, they are watching protests that mark the 50th anniversary of the ’68 protests. Stolar joined the Lawyers Guild in 1970, but in the years after the DNC riots, the guild’s handling of its observers and the defense of protesters “felt disorganized for a long while,” he said. The job of legal observation seemed vague even to observers, who at times were uncertain if they were acting as a witness to a protest or as a potential legal counsel. After being stretched thin by the Occupy movement of 2011 and 2012, Meyer helped set new guidelines: Observers are legal watchers, not legal counsel. They do not negotiate between protesters and police. Requests for observers must be submitted (though the group is known to attend impromptu protests). Every observer goes through training, and no observer is allowed to protest alongside the people they are observing. Jim Fennerty, a Chicago attorney many credit with helping to mature the local observer program, said the system is so relatively streamlined now that some protest organizers send them a list of names of those planning to be arrested (with the correct spellings). Yet observers don’t pretend to be politically neutral. They wouldn’t, say, provide Legal Observers for a white nationalist rally in Chicago — unlike the American Civil Liberties Union, which has its own, much smaller observer program (complete with orange hats). Less certain is how observers are seen by authorities. As the march on Lake Shore Drive exited onto Belmont and continued toward Wrigley Field, helicopters hovered overhead; at the rear of the protest, police SUVs formed a dark, thick rolling wall. A half-dozen observers spread along across the long, flowing shape of the protest, staying close to clusters, walking at sides, staking out the back. Observers watched and walked, talked among themselves, about the heat, the popularity of escape rooms, the Cubs, how much Chicago was spending guarding this march alone. At the corner of Addison and Clark, the protest stopped and held court, and Millicent Hoffman, who has been an observer since 2014, stayed close to the front. At Wrigley, fans lined the upper decks and some watched silently and some shouted insults. Then after an hour or so, the protest tapered off and the media packed up and no one was arrested. But Hoffman stayed until the very last protester. She has a rule: She goes go home when the protesters go home. Or she leaves when the police leave.